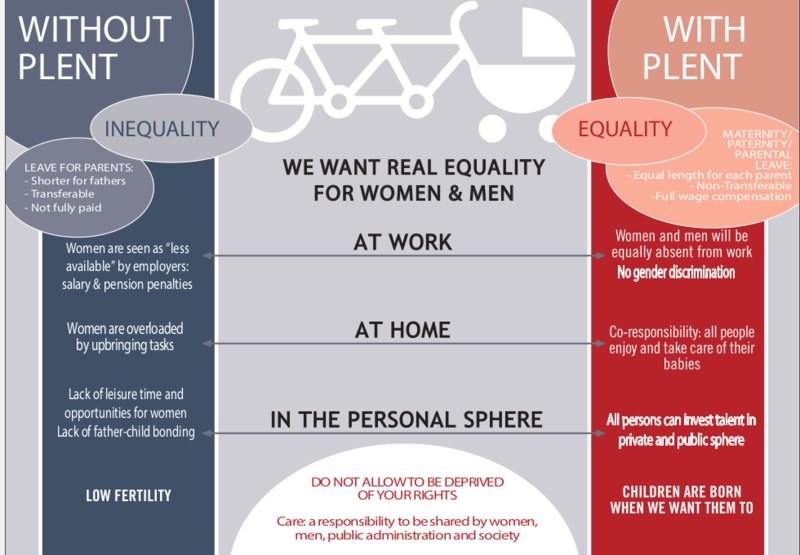 PLENT is an international network of individuals and organizations that aims to knock down one of the main pillars of inequality between men and women: the deficit of leave for fathers (comparative to that for mothers) in case of birth or adoption. PLENT is independent from any political party or religious creed and is not funded by any private or public national or international institution. NON-TRANSFERABLE, EQUAL IN LENGTH FOR BOTH PARENTS, AND PAID AT 100% OF THE SALARY, as the only way to attain equal rights and equal dedication to care by men and women. EQUAL: all individuals should have the same rights to care for their babies. 100% PAID: all persons should be financially independent all along their lives. In fact, unpaid or badly paid parental leaves are extensively taken by women, leaving them without income and social protection. Who can be part of PLENT? If you agree with this goal, then you can! PLENT is open to all persons or organizations of any kind who advocate for this parental leave design and for the corresponding reforms in each country.